SEO audit This is a detailed website analysis to verify and analyze the site's condition and status as the website itself and configured to meet the search engines (Google, Bing, Yahoo, etc.) optimization criteria. Also to SEO audit includes not only analysis and saying what is wrong or be changed, however, and provides specific recommendations and suggestions. Given the uneven SEO audit SEO audit and the audit so the prices are different. Common SEO audit can cost from 100EUR to EUR 100000. Price should depend on how much detail and how thorough audit conducted himself, but I think the key is to not audit the amount of data (number of pages with lots of data, which do not bring real benefits)But the most important is accurate and specific recommendations WHAT AND HOW TO CHANGE, to improve the position of Google Search. Therefore, it is expedient to do targeted audits. (That is the correct site configured for specific keywords). It is often used in various SEO analysis software that just a few button clicks on the site analysis and recommendations, but the program will not always best. It is also very important to know the key elements of the audit and no special software, because otherwise not all, or not quite so you can understand what the program wants to tell you. So the conclusion is that: the company submitting the audit only with SEO audit programs will not always be the best and most suitable, and sometimes is not always properly understood. Therefore, this article you will find basic SEO audit process elements that need to be analyzed in order to carry out the audit. As mentioned above, each company chooses its own SEO methodology and the same process, but here are the basic elements of SEO audit. 1. Website or e-shop main keyword positions in Google search engine analysis. The most common site owners know the main keywords, so if the client provides them, then necessarily analyzed and presented in the above-mentioned position of keywords. Of course, that happens when customers do not always choose the most appropriate keywords for your website. In any case, the audit analyzed the keywords and positions offered new keyword list with additional justification. 2.Submitted (the client) and additional (proposed) keyword analysis. analyzed and appropriate keywords using several tools and techniques. The main keyword selection methods is Google AdWords keyword planning tool google search related selector, competitive analysis, keyword selection special program and other measures. Having selected the most suitable keywords should tune with the client (the site owner) on the main list of keywords. It is recommended to materialize five keywords that are the most important and the most appropriate site. It can be confirmed and many more keywords, however, the price on the rise. That is to say according to the selected keyword request 5 SEO.SEO organizations providing audits to audit the performance of focusing only on the selected keywords (i.e. the target auditing). In this case, the client (website owner) received much more specific recommendations and observations on the state of the site SEO, otherwise practically not fokusuojamasi to the most important keywords and are provided only for general remarks. Also, whenever possible and accord pasitvirtinami specific pages that will be assigned to select 5 (or more) keywords. Using Google Analytics and webmastertools data (if available) and measured the so-called "landing page". Estimated or website domain assigned to "brand" domain (brand domain keyword search results are no longer 10, but only 7). Viewing site Cash, (temporary site google data repository) and the assessment of what information is Google Cash, and what is the same site (investigated whether Google indexes everything). Determining whether the service tailored for mobile devices. Page headers Meta (Meta titles) optimization condition. Is the use of appropriate number of characters. Do not duplicated, or all pages describe. Do not duplicated and that all pages are described. Meta keywords use. Already since 2010, or before the official Google Web spam engineer said that the use of meta keywords do not have any value. But many SEO companies are nevertheless amends my, as is a provider pasiskaičiusių, but certainly not all are aware of customers who then complain that it's done. So sometimes it is better to put them in, but only due to the fact that soothe the client, but the actual meta keywords irrelevant. However, it is noted that sometimes the sum is the amount of these keywords, and therefore may be even negative effects. Analyzing appropriate paragraphs (<H1>, <H2>, <H3> <H3>), the layout and the appropriate dosage. It is a common problem for websites designers rarely evaluate the SEO aspects of the design drawn up by them as well as convenient and appropriate use of these paragraphs have quite a significant impact on the internal SEO optimization. Additional content analysis. It analyzes not only the main pages of content, but also the potential sponsoring content (namely Blog or other information svetinė designed to reinforce the principal). And is the sponsoring content plays (by) the strengthening of the other pages. Keyword use of website. DETAILS: HERE. Provides shared a note on the entire site and details of approved (agreed with the client) keyword analysis presented separately. Approved keyword pages detailed analysis and recommendations. The detailed review of selected pages of the situation and for each element of the recommendations and suggestions of what and how to change it. Especially often faced with the problem of electronic shop owners. The main reasons are various filters, sorting, etc., which are exactly the same content of the site is representative of the other URL, but the content is practically the same, and thus creates a large amount of duplicate content. Also, in most cases e-shop owners are not even aware that the content is duplicated, because according to them, that does not use the same text in other pages, but on the technical parameters of the URL content automatically cloned n times. Of course there are all the solutions to solve this. Checking and analyzing whether you (the client) website or e-shop available robots. In some cases, access is blocked and your site is not available at the same indexation and of course in this case you are not the Google search engine results. As such, many liked to create a free website and there are many places where it can be done, but the problem is that the site is blocked from search robots. Navigating the Site. Review and comfortable and easy access to all pages of the site. It is generally guided by the rule that within three mouse clicks (from the beginning of the page) must be achieved in any site content. Also analyzed as directed to the categories and subcategories of pages and the ability to come back. As one of the most important principles is that the website visitor is both convenient and clear, and a page where it is located. It is also seen from the technical side there are no broken links, and so on. Analyzing the site greatly increase the volume (usually electronic stores) make use of SEO programs, and recommendations are made for specific pages and selected by the customer (site owner) agreed keyword lists. A separate analysis of the links on website links located at the bottom of the page (footer). Still it is noted that there are sites where the mass of links to footer that is not good. It also provides guidance on which it should be given a special link "nofollow" tag, which tells the search engine robots from following the relevant links. Contextual link analysis. Many different websites and online stores to install special SEO modules, which should improve SEO positions, but when these modules are used improperly received more damage than benefits (such as the massive creation of links to a specific word, etc.). However, according to the audited site it is not always possible to see absolutely all content links, and makes recommendations and proposals under the relevant approved keywords and their associated pages. It is also recommended from where and to where to direct the appropriate links through relevant content (namely SEO text). This is quite an important part of the analysis to the recommendation, because contextual links have a much higher value than links to footer or right / left column of the page, so it is necessary to use existing content and to obtain an appropriate value. Number of links on the page.Because there are certain recommended maximum number of links, which should not be exceeded. The checks HTTP status codes and what type of referrals to use website. Canonical tags (rel canonical link tags) use of the situation and recommendations. 301 redirects study, analysis and recommendations for how to properly use. In a 404 page (page not found) or configured properly, or the appropriate routing of the 404 page or appropriate information page 404. Does the site have an XML site map? Proper XML format and structure? Is XML sitemap is submitted in Webmaster Tools Instrument. Most content management systems already in itself is quite the good tools that automatically generates a site map, but it is necessary to ascertain whether it is carried out properly. As an example of one of the most popular CMS like WordPress recommend an additive Yoast SEO Plugin, but every time you need to check whether it has been updated and you are using the latest version of the Annex. CMS sites that do not have automatic map generation can take advantage of a variety of free programs (eg . : www.xml-sitemap.com). But like I said the necessary XML sitemap submission to webmaster tools in order to tell us the status and condition. The site loading speed has a significant impact on SEO optimization, so the SEO audit and required to analyze it. Website loading speed is important not only because of the technical condition of the site, but more importantly because of the behavior of visitors. Visitor's action is particularly important as one of the significant things is that many visitors will have the patience to wait for a slow operating website while charging the web page. Usually it does not bother the vast majority of users and does not wait long when the page atsidarinėja by simply choosing another site and it has a significant impact on the SEO results. Firebug. Firefox browser add-on will help to analyze your pages. Moz Crawl Test. Checks where you can reduce the amount of referrals. PageSpeed. Google tool with recommendations for page loading speed. File compression. By using Gzip program can reduce HTML, CSS and Java Script file sizes. Reduce the amount of redirects. Set cash (temporary file recording control). Content Distribution Network (CDW) use of. Especially true when the service is used in several countries. With this tool allows you to place the contents of the site on multiple servers in order to rapidly provide information to the user. Due to the fact that a growing number of people surfing the Internet via mobile devices Google also officially announced that the site adapted to mobile devices will be "punished" and the results of the Google search (via mobile devices) will fall compared to those that have adapted websites for mobile devices. Estimating site application in other countries. Is the domain suffix refers to the language (eg . : www.domens.co.uk, etc.). Check through Webmaster Tools site adaptability by country. Is there a Google Analytics code. Are you properly installed the Google Analytics code on each page, and whether it is used for. Figuratively, plot structure optimized pages (And if necessary additional pages). Page footer analysis and other recommendations. It contains analysis of optimized pages with detailed recommendations for action and what should be done to improve the results of the Google search engine. External links are one of the most important and powerful tools in order to get good SEO results. But it is necessary to obtain appropriate references and be sure to use the proper poison receipt of strategy and plan. Also note that, in particular, must be carried out in an appropriate internal SEO optimization and then external (links receipt, etc.). Playback of existing links and making proposals for them. Because it is not always equal to the reference link. It is important and what it received and even the location of the site. In addition to all that has drawn attention to the fact whether the reference is generally a godsend Googlebot (links with the tag "nofollow" has no practical value added). Recommended links new tactics and receiving recommendations .How much and what kind of links required within a reasonable period of time. 15. The main competitive analysis. 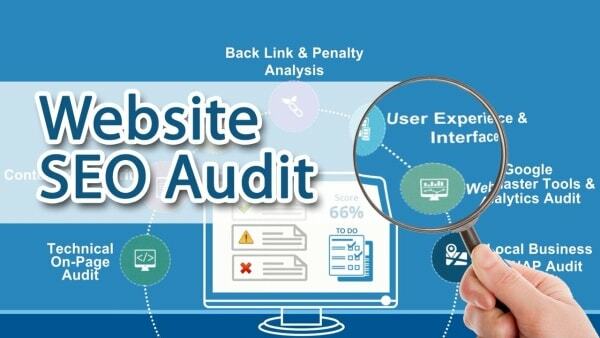 SEO audit should also analyze and assess the main competitors. The assessment of the competition is edited and you (the website owner) SEO plans and tactics depending on your particular situation. Existing reference quantity, quality, and all other information related to the links. Domain age, authority and other domain settings. According to the need to be detailed and specific analysis of the competitor's SEO optimization.